Samhain is the quarter-day festival that starts the Celtic year, marking the start of Winter and the end of harvests. It commences at nightfall on October 31st (new style Gregorian calendar) or the 11th November (old-style Julian Calendar) and goes by a number of different English names including Hollantide, All-Hallows Eve, Hallowe’en and All Saint’s Eve. In Scots and Manx Gaelic the name is the same, although written differently: Samhuinn and Sauin, respectively. The pronunciation is ‘Sow-in’ (rhymes with ‘cow-in’). There are a number of other more archaic names, which I will go on to discuss in due course. It is a festival that symbolizes death – the transitional phase of the seasons when Atlantic Europe’s foliage dies back, and animal life dwindles. The evenings darken rapidly and the first frosts begin to touch the land. Crows and flocks of migratory wading birds throng the skies in great clouds cawing, whistling and chattering. 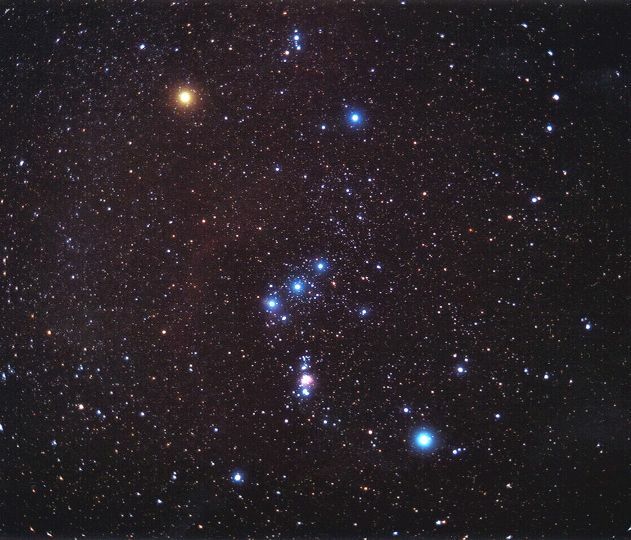 The constellation of Orion begins to dominate the night skies… The spirit which enlivened nature in the summer months has gone from visible reality to the state of an intangible but certain potential for the coming year. In an ancient religious system that viewed life as a continuous oscillation between the tangible living state and a spiritual state awaiting rebirth in the next cycle, Samhain was therefore also the Festival of the Dead. It was Julius Caesar who first noted (in Commentarii de Bello Gallico) that the Gauls held that days started with nightfall, and celebrated the commencement of their important days with the falling of night. The same is true of the other Atlantic peoples, and in Ireland, Scotland and the Isle of Man in particular this continued down to modern times. The festival of Samhain was therefore called Oidhche Samhna – ‘Night of Samhain’ – in Irish, and Oie Hauiney or Houney in Manx. Both would be pronounced pronounced something close to ‘Ee ouna’ allowing for the usual lenitions and aspirations of spoken Gaelic. The Manx had another name yet for the festival – ‘Hop tu naa‘ (pronounced ‘hop the nay’ or as the more modern ‘hop tyoo nay’) – which is of uncertain meaning and sounds curiously close to the Scots name for New Year: Hogmanay. In fact, Samhain was the Celtic New Year – just as days started with a nightfall, so the years started with the dark part also. It is uncertain when the Scots started to use ‘Hogmanay’ as the term for the 31st of December New Year, or for that matter if the term was ever used for Samhain. It seems that folk traditions of the Atlantic European world show quite a degree of transferability across the period between Samhain and the January New Year – customs including guising, playing pranks, gifting and house-visiting were just as likely at Christmas and New Year as they were around the 1st of November. Whether this represents a natural tendency to transfer celebrations that brighten the dull winter months or a concerted religious effort to dissipate or transform wholly pagan festivities remains unclear, but a combination of factors is likely. There has always been a strong association of the festival with a ‘witch’ or ‘witches’ that has continued right down to the Halloween celebrations of modern times. The Celtic peoples never really had much time for the idea of ‘witches’ in the 16th/17thC judicial and religious sense of a person who worships the Christian Satan and does magic to harm their neighbours. The ‘witch’ referred to in Celtic areas is generally best interpreted as a Christian opinion of the old Goddess herself, rather than a human individual at the margins of society. She seems to be represented by the folklore character referred to as the Cailleach – a monstrous ancient female supposed to have created the landscape and unloosed the rivers, and supposed in some traditions to be responsible for winter. To the Celtic peoples of Ireland, Scotland and the Isle of Man ‘The Witch‘ was a figurative legendary character representing Christian opinion of the ancient Goddess, rather than a clear and present social threat posed by ‘a witch’. For this reason, there were hardly any executions of suspected ‘witches’ in Celtic cultural zones. ‘Jinny the Witch jumped over the house to fetch a stick to hit the mouse’ (line from an old Anglo-Manx Samhain guising-song) – the constellation of Orion presides over the winter skies between Samhain and Imbolc (1st February). Cnoc Tlachtga (now also called ‘The Hill of Ward’) near Athboy, Co. Meath was also a place legendarily or historically associated with Irish Samhain festivities, including the lighting of a bonfire. This Hill was supposedly eponymously named from a magical female of the same name, the daughter of a magician-druid called Mug Roith/Mog Ruith who was suppose to have given birth to triplets on the hill before dying. Another site associated with paganism, death and Samhain was, of course, Magh Slécht (Mag Senaig) in Co. Cavan, supposed to have been the site where ‘Tigernmas’, an ahistorical pagan High King of Ireland died along with many of his followers while worshipping an idol called Crom Cruaich at Samhain. This idol was supposed to have later been broken by Patrick. There are many other traditions besides, including the tale of the Ulster Cycle called Serglige Con Culainn (The Wasting Sickness of Cúchulainn) were the Ulster hero is attacked and seduced by the Queen of the Otherworld – Fand, wife of Manannan – during the course of Samhain celebrations of the Ulaid. Irish legend also place the start of the Second Battle of Maigh Turead at Samhain, and it commences after a sexual coupling of the Dagda with the Morrigan. Likewise, the cattle raid of the Tain Bo Culainge commences at Samhain, and the tales of this also feature the Morrigan, who I have earlier identified with the Cailleach. The medieval tale The Boyhood Deeds of Fionn claimed that the Fairy Hills (Sid) were open at Samhain. You can tell from ancient Irish literature that Samhain had a particular association with death and the otherworld, and with potent magical female characters! The themes of conflict and death at Samhain follow on from the Harvest, and then the very visible Atlantic autumn die-back of nature – replete with withering, decay, storms and darkness. These processes are set in motion from the festival of Lunasa (Lughnasadh) onwards. The die-back to pagans was simply a part of the renewal-cycle and therefore did not have the confused connotations of ‘evil’ or ‘uncleanliness’ that was imported with the somewhat ectopic Judaic religions during the 1st millennium.